Most 13-year-old girls wouldn't see having a scar down the middle of their chest as, well, cool. Lola Montilla, however, is not most 13-year-old girls. When she sees the scar left from surgery to repair the heart defect she was born with, she says it's a reminder that what doesn't kill us makes us stronger. 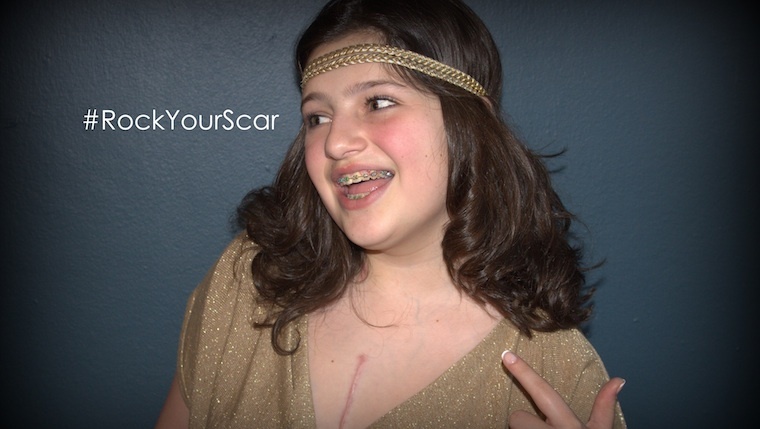 "I really, really like my scar," Lola told us from her home in Puerto Rico. "Every time I look at it, it makes me think, 'Wow, I really did go through this, and I'm now back here at home.'" Lola's mom, Mari Serrano-Montilla, says she and her husband first learned their daughter would be born with Ebstein’s anomaly -- a rare heart defect that causes blood to leak back through the tricuspid valve, forcing the heart to work much harder than normal -- late in her pregnancy. "Our doctors here in Puerto Rico said she might need surgery, but it was a matter of just seeing how much progress she made," she says. Fast forward to just before Lola's 13th birthday, when things suddenly took a turn for the worse. "She started complaining that she was feeling really tired," Mari says. "She then started turning blue." Her doctors in Puerto Rico discovered Lola's heart had gotten much bigger since her appointment the year before. "So they said let's keep watching her and see how things are going," Mari says. "She was feeling really out of breath, so they did put her on oxygen therapy 24 hours a day." Then, one Friday afternoon, Mari says her phone rang. "Lola's doctor called me and said, 'You know what, I just came across this publication from Dr. Joseph Dearani at Mayo Clinic.'" In that publication, Dr. Dearani had written about an innovative cone reconstructive procedure for the tricuspid valve that Lola's doctor in Puerto Rico said might just be "what we have been waiting for all along." The family began making arrangements to travel to Rochester. Then Lola went to her parents with a request. "She said, 'I know you guys want to keep all of this a secret, and I know you want to protect me, but I need people to know what's going on, because I don't want people making up stories. I want people to know that I'm going to be fine,'" Mari says. So Lola's father drew up a heart-shaped logo surrounded by the words: "Stay Strong. Stay Brave. Team Lola." He posted his creation on Facebook, where family, friends are others could show their support. And those others, it turns out, include celebrities like Sophia Vergara and Eric Winter, among others, who posted photos to show their support. "That's been wonderful because it's helped take her mind off of the scary stuff," Mari says. Fortunately for Lola, that scary stuff ended one short week after her surgery, when her doctors proclaimed her ready to return home. Mari says she wasn't so sure at the time. "I almost told them, 'I'm not taking her home yet! She's not ready!' But she recovered really fast." The family also set up a Team Lola website/blog that Lola says she wants to keep up as a way to give hope to others like her. "It's important for me to share my story, because I think some kids might be afraid to get surgery," she says. "Also, some parents might be trying to figure out how their kids will be feeling after having a surgery like this. I'm class president now, and I feel like a whole new person." You'll feel like a new person after sharing your comments below, and using the handy social media icons to share this story with others.